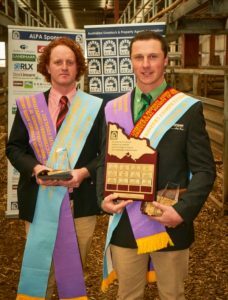 The 2017 ALPA Victorian Young Auctioneers Competition winner Murray Bennett of Landmark, Wangaratta, at right, with runner-up Joe Allen from Elders in Euroa. WANGARATTA Landmark agent Murray Bennett has won the 2017 ALPA Victorian Young Auctioneers Competition. Runner-up in the Australian Livestock and Property Association’s state final the at the Victorian Livestock Exchange’s Pakenham saleyards today was Joe Allen from Elders in Euroa. 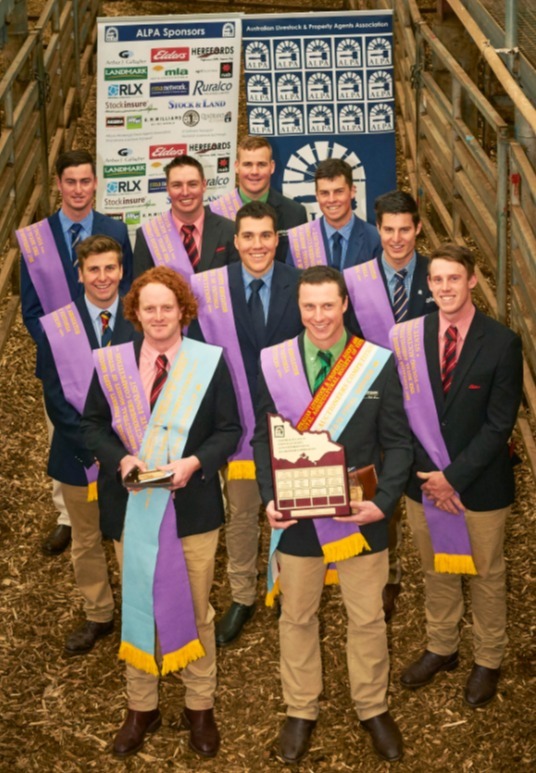 The young stock agents will represent Victoria at the 2018 ALPA National Young Auctioneers Competition held at the next Sydney Royal Easter Show. Ten young auctioneers from across Victoria travelled to the VLE yards at Pakenham to compete in the 2017 ALPA Victorian Young Auctioneers Competition final. This is the fifth year the VLE, Pakenham has hosted this event. The competitors were selected at an ALPA auctioneers school held in June at Bendigo. Over two days, the attendees were presented with important industry information and improved their auctioneering skills through voice conservation and care from industry renowned speech pathologists and coaching and training from experienced auctioneers. ALPA chief executive officer Andy Madigan said training young stock agents is an important part of what ALPA does. The competitors sold commercial cattle that had been sourced locally by the Pakenham Stock Agents Association. The cattle were judged by buyer Robert Radford prior to the competition as part of The Royal Agricultural Society of Victoria Prime Stock Competition. A large and excited crowd watched on as each competitor sold their three lots, ALPA said. Three judges selected for their industry experience and strong selling background determined the winning auctioneer, based on his diction, values, voice and manner. The night before the competition, competitor’s friends, family and industry members attended the annual ALPA Victorian Young Auctioneers Competition Dinner. A highlight of the night was the charity auction, conducted by last year’s ALPA Victorian Young Auctioneers Competition winner Toby Newnham of Elders in Swan Hill, which with the competition raised $18,356. The funds will be donated to the John Logan Foundation, a not-for-profit charity that offers financial support to people diagnosed with cancer. The foundation assists by contributing to the cost of prescribed treatments and procedures that are not available on the Pharmaceutical Benefits Scheme, ALPA said. ALPA 2017 Victorian Young Auctioneers Competition finalists: front row, from left, Joe Allen, Elders Euroa; Murray Bennett, Landmark Wangaratta; Lachlan McAllister, Elders Bendigo. Middle row, Pat McKinnon, HF Richardson Ballarat; Tim Gibson, Alex Scott & Staff Korumburra; Tom Davies, Rodwells & Co Wangaratta. Back row, Zac van Wegen, Kerr & Co Livestock Hamilton; Matt Jones, Elders Mortlake; Nick Farley, Landmark Bendigo; Matt Rowlands, BR&C Agents Swan Hill.